Investigate and analyze wavelength, frequency and amplitude of longitudinal and transverse waves. Determine the speed of sound experimentally and describe how various materials and temperatures affect wave transmission. Compare wave characteristics to natural auditory phenomena. 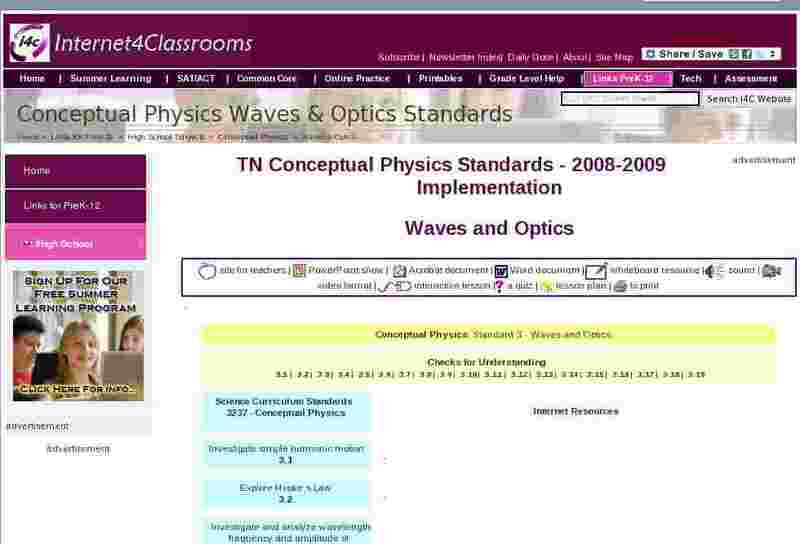 Explore properties of the electromagnetic spectrum. Investigate reflection, refraction, diffraction, and interference of light waves. Investigate the polarization of plane and curved mirrors. Use ray tracings to solve optics of mirrors and lenses problems. Solve problems related to Snell�s laws. Investigate optical phenomena (e.g., mirage, optical illusions, and dichromatic lens effect). Distinguish between coherent and incoherent light. Examine the properties of lasers. Explore the additive and subtractive properties associated with color formation.